This morning was spent with one of my sisters, sipping steamy mugs of tea and knitting while simultaneously tending our passel of little ones. 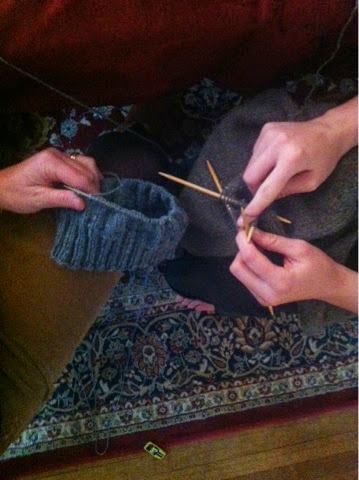 Kate and I ended up trading our knitting projects: my sweater was behaving badly and the stockinette on her hat was a bore. The hat is nearly done now and based on Instagram updates, it seems like Button's sweater may actually be on his body rather than stuffed into a project bag tomorrow! Now that is a great idea and I wish I had someone to trade of with when my knitting is not behaving. What a lovely day that must have been. And I love the idea of switching projects. That is just genius!!! That sounds like a lovely morning :) Having someone to knit with must be nice, especially when you're working a bazillion rounds of stockinette stitch!